Breeze Block Family was a spur-of-the-moment piece of work. 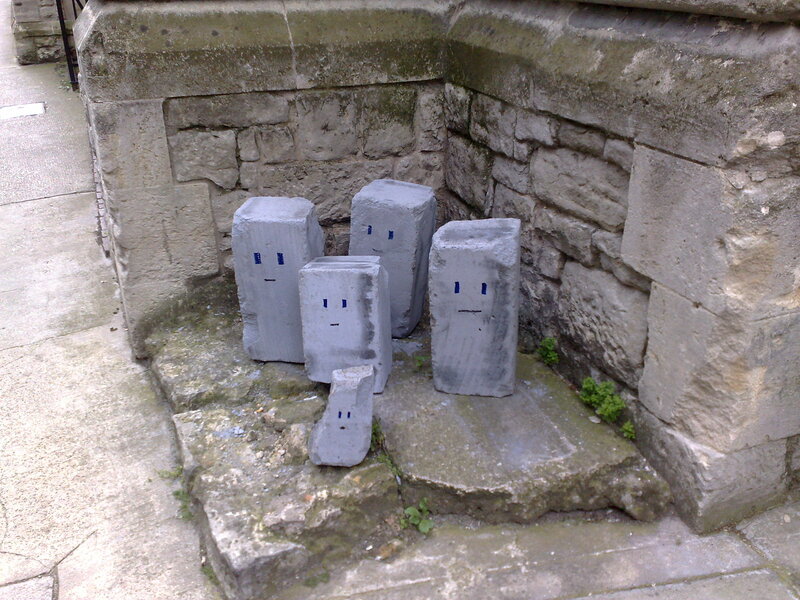 The blocks were found abandoned on the street, at the location shown in the photograph, near the artist’s studio. He passed them every day and soon realised their potential. Michael swiftly re-arranged them and added the faces with a Magic Marker. The work was left on the street for four months, before being removed by persons unknown, making the work a free (yet temporary) experience for any passer-by, that now exists solely in the memory. Their absence is as poignant as their presence was. As well as being a manifestation of Michael’s sense of humour, the work represents the potential for transformation of the material world, but at the same time rooted in the tangible. From something as simple as building materials it is possible to create a new reality other than construction. In this respect, it almost does Carl André’s work for him but with the addition of reflecting on the humourous side of the human condition. At the same time, the work does engender a kind of sympathy and protectiveness in the viewer, as it impossible to avoid responding to the work’s various personalities. The individual parts do indeed appear to have soul and character, and demand to be remembered in the way that one would remember a deceased relative.